This exceptionally ornate brass statue, sublimity enshrining the face of the represented figure, and rhythm, wreathed into her form – into every curve and gesture of her parts, an icon usually classed as Deepalakshmi in Indian iconographic tradition, represents a young woman holding in her hands a large lamp. In ancient and medieval India, and even till recent times, transporting light in the form of lit lamps was a regular activity performed invariably by women, a maid or a household, at a palace or a hut. Held close to the bosom and often protected from winds by a part of one’s ensemble the light centring and reflecting on the face of the courier always multiplied its glow : the sensuous beauty of the young spouse and the divine aura on the mother’s face. A local version of Rama-katha alludes to Anasuya, the wife of the known sage Atri, emerging from her hut with a lit lamp in hands when around the evening Rama, Sita and Lakshmana reach Atri’s hermitage. The tradition contends that the light that Sita saw reflecting in the divine eyes of mother Anasuya was Sita’s light for ever and whenever she recalled it, darkness illuminated with light. Obviously, in Indian context light always had divine dimensions, and even when its courier was a maid possessed of sensuous beauty, she was seen as having an amount of divinity as had an enlightening goddess and commanded respect. 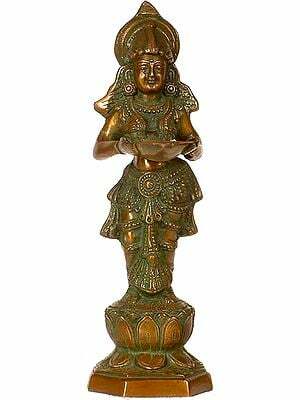 Sculptures of a lamp-carrying maiden begin appearing quite early, however, her classification as a goddess, especially as a form of Lakshmi who was associated with Diwali, the festival of light, since long before, is datable to around the first half of the seventeenth century. These statues of lamps’ carrying young women were initially used as articles of gift made to relatives, superiors and friends, a tradition which emerged first in South, perhaps at Vijayanagar. Later, it was widely followed all over the land. Deepalakshmi has been ever since a cultural icon that harbours light, keeps it up, and promotes all that light promotes. Far ahead of the Western concept of ‘torch-bearer’ – the guide or the mentor – an intellectual being, in Indian tradition the courier of lamp was seen as a divine presence that lighted the path by its mere presence. 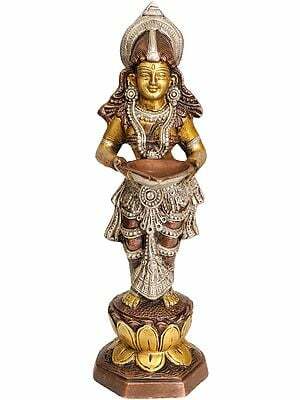 It was for such reasons that statues of a woman carrying lamp in her hands were often seen posted on the entrances to temples, palaces, mansions or houses. These Deepalakshmi statues, a name they subsequently acquired, presented a strange blend of spiritualism and secularism. They manifested divinity but not linked to a sectarian line they were completely secular, and hence, adorned any door, or any sitting chamber, even an Islamic or Christian ruler’s, by their sheer aesthetic beauty and inspired by their power to spread light. 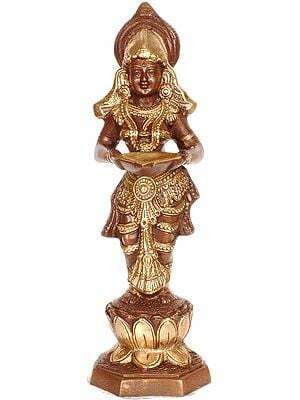 Now for over three hundred years a Deepalakshmi statue is one of the most auspicious object in any house, and as significant an image for Diwali worship as Goddess Lakshmi herself. This brilliantly conceived brass-cast is outstanding in the figural quality of the image, in its modeling, plasticity, grace, divine aura and iconographic details : round face with sharp nose, rounded cheeks with cute lips socketed within and deep thoughtful eyes arching over, a large bead-like moulded chin and a blissful composure on the face. As absolute is the figure’s anatomy consisting of a well defined neck, sensuously moulded breasts, subdued belly, broad shoulders, voluminous hips twisted to right that adds to the part greater volume, and a proportionate height. Wearing a towering Vaishnava crown, ‘makara-kundalas’ – ear-ornaments designed like crocodiles, broad necklaces, elaborate waist-band and armlets conceived with two peacock motifs, strange and delightful, as a pair of the dancing bird is perching over shoulder-joints. An auspicious icon peacocks enhance the image’s auspicious influence. Elegantly pleated and embellished ‘antariya’ – lower garment, is another exceptionally artistic element of the figure. This description by Prof. P.C. Jain and Dr Daljeet. Prof. Jain specializes on the aesthetics of ancient Indian literature. Dr Daljeet is the chief curator of the Visual Arts Gallery at the National Museum of India, New Delhi. They have both collaborated on numerous books on Indian art and culture.